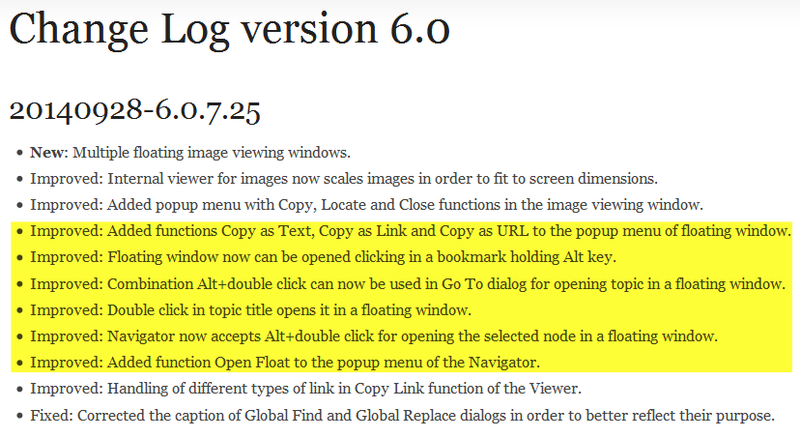 One of the main innovations of ConnectedText v. 6 was the introduction of floating windows, which allowed the user to view multiple repositionable CT ‘topics’ (documents) while for instance editing another topic in the edit window. Besides other enhancements, today’s update of v. 6.0.7.25 improves the functionality of floating windows in a number of ways. Firstly, you can now launch floating windows from a variety of new locations: by double-clicking on the topic title in the viewer/editor’s header; by ALT-clicking on a bookmark; or by ALT-double-clicking in a Go To dialog window or on a node in the Navigator (CT’s visual browser of topics). The other improvement that stands out for me is the adding of a number of Copy functions to the floating window’s context menu. My favourite is the “Copy as URL,” which allows you to paste links to CT topics into external applications (e.g. WorkFlowy) and then launch them from there.